When Ozdemir Ahmet ws considering his study options for an undergraduate degree in Sociology, it was a family recommendation that led him to LSBU. "My dad had actually studied his MA Applied EU Studies at LSBU and was very positive about his experiences there," he says. "The location was also ideal, so it was the natural choice for me." Before enrolling on the course, however, Ozdemir joined one of our six-week summer courses, which are specifically designed to prepare students for undergraduate study. "Passing the course was actually one of the conditions of my application," says Ozdemir. "It was an excellent preparation for my degree though, and really helped me to make the transition to undergraduate study. It's quite intense – five days a week for six weeks – but it gave me a great opportunity to meet the Sociology academics and some full-time students as well. Everyone acted as excellent ambassadors for LSBU, and were very positive about the BSc (Hons) Sociology degree, which confirmed to me that I was making the right decision." Starting his full-time course only demonstrated further that Ozdemir was on the right course for him. "I'd been keen to study Sociology, especially the persuasive nature of language and understanding what makes people and societies tick, but actually starting study at LSBU opened my eyes to what a rich subject it really is," he says. I found the topics we covered to be really engaging, and my fellow students were all motivated and ambitious – which in turn encouraged me to really make the most of the opportunity to further my knowledge and understanding. Ozdemir also feels that he benefitted from the encouraging ethos amongst LSBU staff, both on the course itself and in the wider services we provide to our students. "The lecturers really give the students a lot of attention," he says. "You are never made to feel like you are wasting their time, and they have such enthusiasm for the subject that you can't help but feel you are moving into a really healthy and exciting career. The employability services were also very helpful when it came to getting my CV into a good shape too – I just felt as though everyone I dealt with at LSBU was on my side." 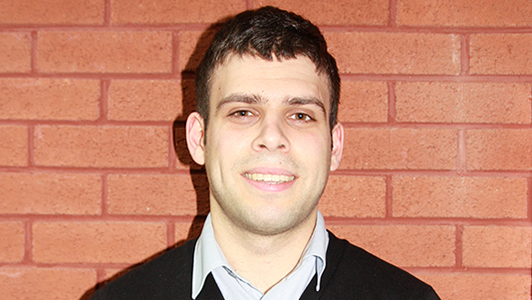 After graduating, Ozdemir moved on to study a Masters degree before starting work as a Project Co-ordinator for the London Centre for Social Studies. "I'm really enjoying settling into the role," he says. "I've co-ordinated roundtable discussions with expert names on Scottish independence. Videos, photos and summaries uploaded on to the website." The team is run by six full-time staff and a team of volunteers, and Ozdemir actually joined on a voluntary basis. "I was working in a call centre to fund my Masters and decided to volunteer to gain some useful extra experience. However, after three days working as a volunteer, I was absolutely thrilled to be offered a full-time post." It shows that the background I had developed at LSBU and during my Masters contained all the right elements needed to get the kind of role I was looking for. I'm very happy here, and am looking forward to the future with a lot of optimism.